What is Arkansas food? Kat Robinson has intensely studied the cuisine of the region for more than a decade. 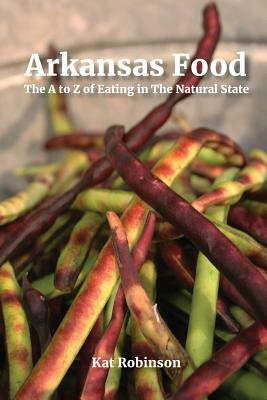 Arkansas Food: The A to Z of Eating in The Natural State is the culmination of that research, laid out in a handy glossary including everything from apple butter to zucchini bread. Diving past the triumverate of Arkansas's most sensational foods of cheese dip, fried pickles and chocolate gravy, Robinson delves into the nooks and crannies of every corner of the state. Discover the state's famed garden bounty of PurpleHull peas, watermelon, peaches, apples, butter beans, Esau sweet corn, yellow and cushaw squash and Bradley County Pink tomatoes. Celebrate Arkansas food brands with broad appeal, such as Cavender's Greek Seasoning, Grapette soda, Mountain Valley Water and Petit Jean smoked meats. Taste flavors from legendary restaurants, including Wayne Shadden's barbecue sauce. Coy's Steak House salad dressing, Cotham's Mercantile's fried green tomatoes, and the Venesian Inn's Italian salad. Learn about hunting duck and deer, why fried chicken and spaghetti are served together in the Ozarks, how to tell the difference between the two types of buffalo and how to pronounce the word "crappie." With more than 130 Arkansas recipes, 450 full color photographs and over 300 topics, you'll be sure to crave what The Natural State brings to the table.